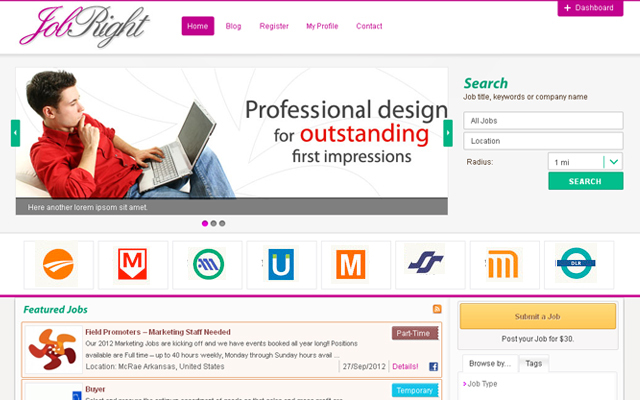 JobRight is a premium child theme for Jobroller. 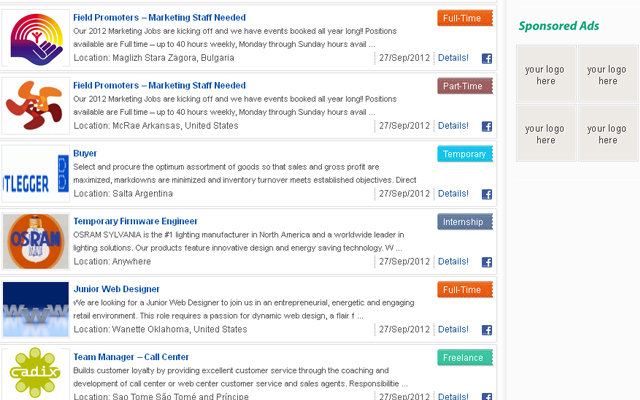 Transform your WordPress web site into a fully functional professional job board with a good looking interface. Jobright is a super awesome JobRoller child theme. It’s got a very clean, sleek, and modern design. It’s perfect to create a unique Job board. Home page advertising banner logos areas are widgetised. Search bar widget (no plugin required). 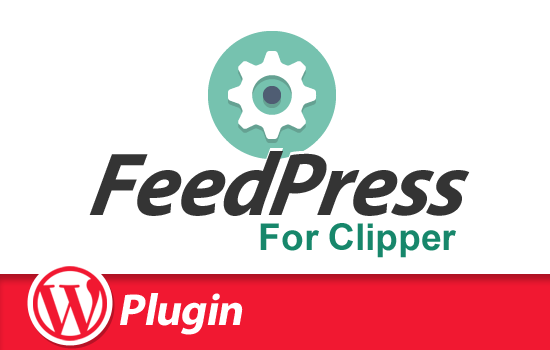 Banner slider (no plugin required). 8 Advertising spots (logos) widgeted in the home page. Pagination with numbers instead of next/previous page. Styled menu managed from the custom menus of wordpress. Sophisticated top drop-down menu with some intelligent functions to ease navigation to the dashboard and profile. Designed search engine (radius ,inputs and button). Job types labels designed to fit the elegant look of the theme. Full-width (no sidebar) page template created. All the website is same look and feel. 5 Color schemes to fit all tastes. It supports all Jobroller features and functions.. 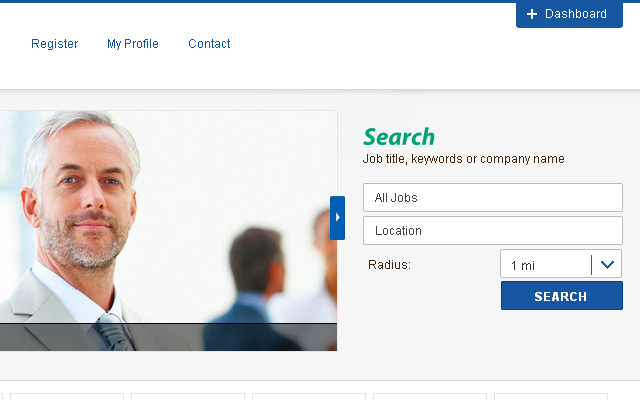 If you need support, feel free to contact us at contact@jobthemes.com, or use the AppThemes support forums. 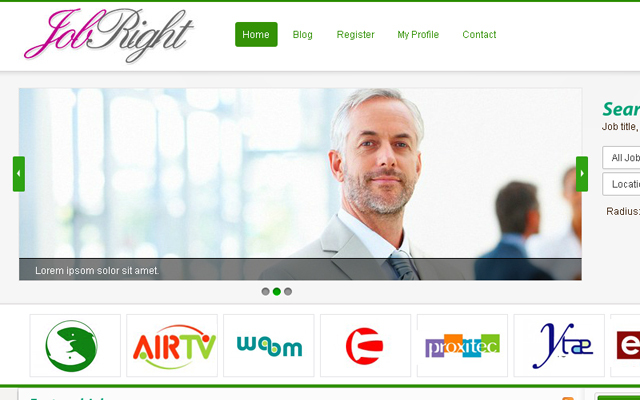 Your Jobright now is installed and ready for use. 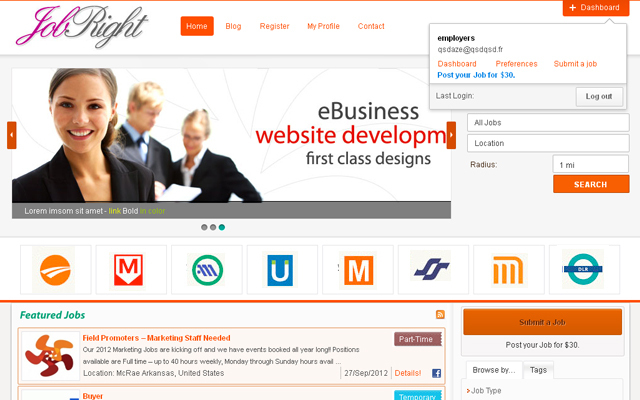 Note: After activating Jobright, a sub menu would be created for the images slider in the header. through this panel, You can control/add/delete/change the images in the slider. (the slider support excerpt). Note 1: After activating Jobright, a sub menu would be created for the images slider in the header. Through this panel, You can control/add/delete/change the images in the slider. The slider support excerpt option which enhanced with WYSIWYG function to change the style of the text. Note 2: The theme creates new widgets, such as the search engine in sidebar, the logos in the banner,.. To use them, Just go to appearance =>widgets => Drag and drop the new widgets in the appropriate sidebars. We love it – works well and it is fast. The support is great as well. The best child theme I purchased so far for Jobroller. hopefully waiting for your reply as soon as possible. Great theme, fun to work with and a great support community. Jobright is an awesome child theme to give that different look to Job roller, it gives you different style and colour options and support is helpful and fast to respond if you need it, Highly recommended. Just got to say that this theme is awesome! It has lots of flexibility and works great and looks great. Spartac, the author gives the best support that I’ve ever received in the industry. Because of the support, it’s definitely a top contender not to overlook. few more weeks are gone – any news in that case? October is coming – still no news in behalf of ver. 2.0 ? is that child theme dead? Sorry to bother but, any update on this? Hi Spartac. Any news on this or Jobright 2.0 ? It would be great to have a new theme blog+job style like this one in the start of 2019. Been waiting for 3 years now and 1 year after the promisses of a stable version of a all new version. 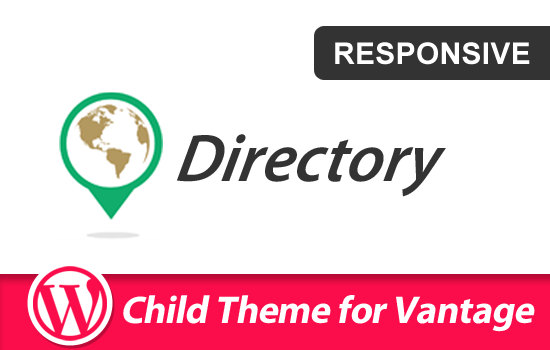 A modern, professional and super flexible Hirebee child theme.